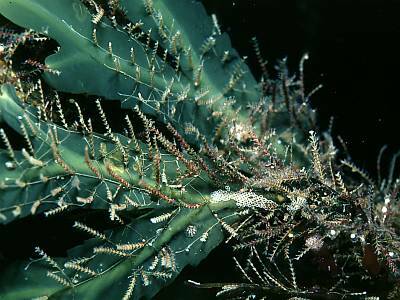 Description: This hydroid consists of upright, unbranched or sparsely branched main stems arising from a branching rhizome. The stems bear triangular hydrothecae and are constricted between each pair to a narrow waist. Habitat: Typically this is a shore species, normally growing on the brown seaweed Fucus serratus. It is most abundant on shores subject to strong water movement from tidal streams or wave action. It may also occur in brackish water, below low water mark, but is otherwise not usually found in the sublittoral zones. Distribution: A common and widespread species in the British Isles. Similar Species: Most likely to be confused with Diphasia species, due to its opposite, paired hydrothecae. Picton, B.E. & Morrow, C.C. (2016). Dynamena pumila (Linnaeus, 1758). [In] Encyclopedia of Marine Life of Britain and Ireland.